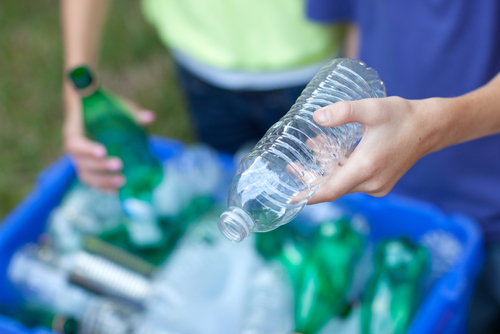 Here are 5 ways to reduce waste in your home and simplify your life. More and more people are beginning to appreciate the importance of sustainable living, the practice of reducing their impact on Earth’s resources. You might be wondering what this looks like for you and your family. Well, the good news is that there are many different ways that you can implement sustainable living. A great way to begin is to reduce waste in your home and simplify your life. Once you get started, you may be surprised what you can live without. Reuse – Many of the items around your home can be reused for other purposes. Try reusable shopping bags the grocery store. Fill up reusable metal or glass water bottles with tap water instead of buying plastic ones. Save mailing boxes and packaging to use again when the occasion arises. Consider swapping out disposable paper towels, wax paper, and aluminum for alternatives that you can use again. Get printer ink cartridges refilled. Invest in a safety razor instead of repeatedly buying disposables. Consider composting food so that it doesn’t go to waste. Find create uses for old furniture, clothes, and appliances. Get a travel mug and bring it with you to your favorite coffee shop. Make Your Own – Many of the household products we use every day can be made at home. This will certainly cut down on your grocery bill. These products include household cleaners, toothpaste, hairspray, drain cleaner, ironing starch, laundry detergent, and lip balm. You can even make your own dishwashing detergent, shaving cream, bug spray, hand wash, lotion, stain remover, and glass cleaner. Recycle – Keep a recycle bin in or near your home for paper, cardboard, glass, plastic, and newspapers. Don’t forget about electronics either as e-waste has become more and more of a problem. Find an electronics store that recycles gadgets. Consider donating books, clothes, and shoes that don’t fit or that you do not want any more. Think about giving away bigger items like appliances on websites that connect people in your local community. Reduce – Cut down on what you need. Buy in bulk and plan out your meals in order to reduce food waste. Buy music and movies online. Purchase used items whenever it is possible, and consider borrowing items from others if you only need it for a short time. Take yourself off of catalog lists and get all your bills electronically. Make use of your local library or e-readers instead of purchasing printed books. Simplify – Go through each room of your house and make a list or pile of items you do not use and want to get rid of. Add a donate box somewhere in your house. Put in extra shelves for cluttered rooms or closets. Consider getting broken items fixed before buying new ones. Post a grocery list in a common room where everyone can add to it. Organize your finances and set a budget. Create a sense of openness in your home by removing all items from one space like a counter or wall. Everyone needs to declutter every six months, yet it is an ongoing process. Kitchen clutter can pile up. I recently went thru everything in the kitchen and stuff not used went to group homes in usable cond.. Ditto for extra linens, towels not being used. At end of summer and winter, clothes not worn gets donated. Garage stuff can also pile up. Less junk around means items easy to find. Things get misplaced and people go buy a new item because of clutter, unable to find lost item. I may not agree with all points like I use paper towels for cleaning up pet messes or kitchen spills, alum. foil used to line baking pans for easy cleanup, etc. I do recycle to keep out of landfill.